Former first minister Alex Salmond. Alex Salmond insisted yesterday that he had never broken the law or “sexually harassed anyone” as the former first minister came out fighting over misconduct allegations. He admitted he was “no saint” but repeatedly denied “any semblance of criminality” as it emerged that police were looking into explosive claims relating to his time in office. And the former north-east MP and MSP continued his attack on the Scottish Government’s complaints process and permanent secretary, saying he had been denied “natural justice” and that he had demanded an inquiry into how details of the probe were leaked. Mr Salmond was speaking to journalists near Linlithgow just a few hours after Leslie Evans, the permanent secretary, confirmed that the Scottish Government received two allegations about his conduct in January. The former first minister was notified of the complaints in March, and an investigation concluded on Wednesday. Ms Evans’ plan to make details of the case public prompted Mr Salmond to launch legal action against the Scottish Government on Thursday. Nicola Sturgeon, his former deputy and subsequent successor as first minister and SNP leader, was visibly upset during broadcast interviews as she addressed the issue, but said “complaints were made that could not be ignored or swept under the carpet”. She added: “My relationship with Alex Salmond obviously makes this an extremely difficult situation for me to come to terms with. I am also acutely aware how upsetting this will be for my party. Mr Salmond refused to be drawn on the nature of the complaints, which are believed to date back to 2013, or whether concerns had previously been raised about his conduct. “I said I’m no saint. I’ve made mistakes politically, I’ve made mistakes personally. But I refute the complaints made against me and I absolutely deny any semblance of criminality,” he said. Mr Salmond, whose seven years as first minister ended when he resigned after the 2014 independence referendum, revealed that he had spoken to Ms Sturgeon three times about the complaints, and that his wife Moira and other family and friends had been “very supportive” since the issue emerged. He also revealed that he had not been told who the complainants were, or had seen the evidence or witness statements, and denied that the police had launched an investigation. Mr Salmond is seeking a judicial review at the Court of Session over the Scottish Government’s handling of the complaints under a recently adopted process. “It does seem totally remarkable – I know it’s a new process, untested and all the rest of it – that you could introduce something that is so flawed and bereft of natural justice,” he claimed yesterday. However, the SNP faced pressure from opposition parties last night over the future of Mr Salmond’s party membership in the wake of the claims. Scottish Conservative MSP Rachael Hamilton said: “We do not yet know the substance of the allegations facing Mr Salmond. All that can be said is that, in deeply sensitive cases like this, due and fair process should be followed. Lynn Henderson, national officer at the PCS trade union and STUC president, said: “Whilst we can’t comment on the detail because there’s a legal process under way, I want to reiterate that all workers have the right to go to work without fear of harassment be it sexual, or otherwise. 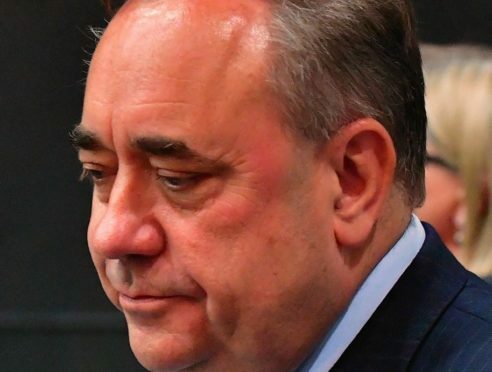 Alex Salmond has launched court action to contest the complaints process that was activated against him amid allegations about his conduct towards two staff members in 2013, when he was still in office. The guidelines were published on the Scottish Government’s private intranet site last December, and were made public two hours after the claims about Mr Salmond emerged on Thursday night. They advise staff members about the way to raise an issue an issue involving a current or former minister, as well as detailing how the complaint will be handled. A conversation will be held with the complainer about how to best resolve the issue. They can ask for their concern to be acknowledged, but no further action taken or lodge a formal complaint. A senior civil servant will be appointed as investigating officer, and will independently collect the facts from all parties involved before preparing a report, which is shared with the complainer and minister. The permanent secretary will inform the first minister of the outcome. She will then decide the appropriate response. Current ministers are expected to cooperate fully. If they do not, the matter will be investigated as far as possible without them and they will be advised of the complaint against them and the outcome of the investigation. This will be recorded within the Scottish Government and the first minister will be advised about their lack of cooperation. An investigating officer will be appointed to collect facts from the staff member and any witnesses before preparing a report, which is shared with the complainer and permanent secretary. If the permanent secretary considers the report given by the investigating officer is a cause for concern, the former minister will be provided with details of the complaint and given an opportunity to respond. They will also be invited to provide a statement setting out their recollection of events to add to the record. They can also request statements from other witnesses are taken. If this happens, the investigating officer will revise their report to include these and resubmit it to parliamentary secretary and share with the complainer. The outcome of the investigation will be recorded within the Scottish Government and the permanent secretary will determine if any further action is required, including action to ensure lessons are learnt. If the former minister is a member of the party of the current administration – for example, Mr Salmond and the SNP – the permanent secretary will inform the first minister of the outcome of the investigation. She can then take steps to review practice to ensure high standards of behaviour within the current administration. Likewise if it is a member of an opposition party, the relevant party leader will be informed. A final report will then be provided to the staff member and former minister. If the former minister does not cooperate, they will be advised of the complaint against them and the outcome of the investigation.